Under the direction of Andrew Cuomo, the party has spent a small fortune supporting my opponent’s campaign. 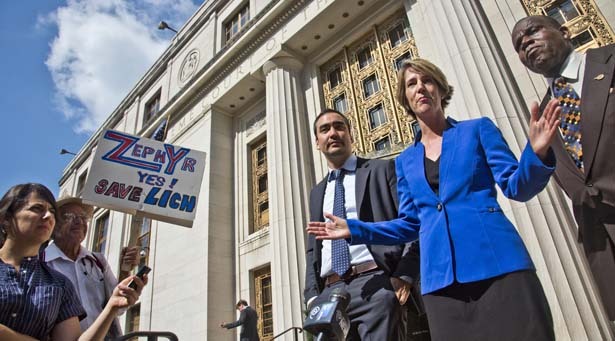 Zephyr Teachout and Tim Wu (AP Photo, Bebeto Matthews). I’m a Democrat, and this year I decided to run in the primary for lieutenant governor. My opponent, former Representative Kathy Hochul, is also a Democrat, but we differ on policy, particularly in areas like immigration policy, environmental protection and gun rights. So far so good, but here’s the crazy part. The state Democratic Party that is running the primary (ostensibly to select the best candidate) is spending money—millions, by our estimates—to try to ensure that my opponent wins. Under the admitted direction of Governor Andrew Cuomo, New York’s Democratic Party has spent a small fortune supporting my opponent’s campaign, including spending on literature for voters, phonebanking, television ads and, most recently, robocalls performed by Hillary Clinton. It is an obvious conflict of interest for the party to both run a primary and then provide aid to one side. That’s why, back in 1911, the New York legislature made it illegal for political parties to spend money to influence the outcomes of their own primaries. Yet despite the illegality and ethical question, the Democratic Party in New York State keeps at it. My running mate Zephyr Teachout and I challenged the party’s illegal spending in court. Lawyers for Andrew Cuomo and the party have responded that their actions are protected by the First Amendment, based on a Citizens United theory. So even though the Democratic Party is running the primary, Cuomo’s lawyers maintain that the party retains a constitutional right to try to ensure that the Governor’s favorites will win it. As of this writing the case is pending—unfortunately, it will likely not get decided before the primary election. But the party’s lawyers have overstated their case, for the First Amendment does not so clearly support such monkey business. Citizens United was about independent spending; here the relevant rule is from Buckley v. Valeo, the 1976 Supreme Court case, which ruled that coordinated expenditures have only limited First Amendment protection. In New York, the only state case to decide on the constitutionality of the rule has upheld the legislature’s long-standing ban on directed party involvement in its own primary. Leaving the Constitution aside, it is also simply wrong for the party to both run a primary and spend money trying to make sure one side wins. Parties are free, of course, not to have a primary at all. But the very reason to have a primary is to try to make sure that the candidates really have the support of the voters. To promise the voters a democratic process, and then tilt the playing field, is ultimately a corruption of the democratic process. Tim WuTwitterTim Wu, a professor at Columbia Law School, is a candidate for the 2014 Democratic nomination for Lieutenant Governor of New York.